This one I’ve actually found through Autotrader. A dealer (link) in Carmel, IN is offering a 2006 Dodge Sprinter 2500, long wheel base with 158″ and high top. The van has 177,285 miles and the dealer is asking $8,999 for it. This Cargo Sprinter has some rust issues, some of them have been addressed already by the previous owner but there’s still some work to do. The price is ok but given the looks of the van and the mileage I would recommend to negotiate a lower price to have some money left for body work. 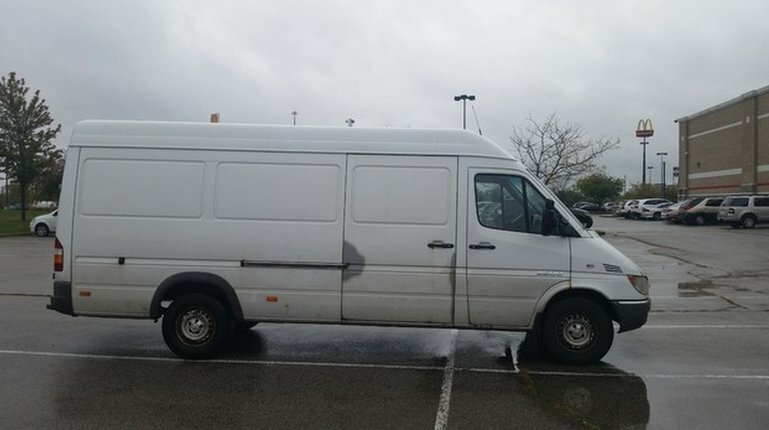 The seller listed the VIN (WD0PD744865936573) so it would be a good idea to check where the van was registered to check if it was living half of its live in the rust belt. The car is a standard 2500 with no power options (means you have to manually open the windows and adjust the mirrors). It has A/C (no details about its condition) and being a 2500 the standard 16″ wheels. Unfortunately, no pictures from the inside, you’ll need to reach out to the seller for details.